I get the sads whenever I walk a certain way to work, because I pass an old, late 1800s house now stuck between a sidewalk and entrance to a parking garage. It is all boarded up and covered over with obvious “modernization” attempts from the 1950s or 1970s, but the brick still shows in spots and there’s a gorgeous Mansard roof. I ruefully reflect on all of the fabulous historic architecture that has been ruined by well-meaning attempts at “updating.” I guess that’s better than tearing down, but not by much. My cure for the sads is to share with you a beautiful house that everyone should see at least once in his or her life. It covers one of my favorite topics, architecture revival styles. Newport, Rhode Island is like a huge museum of architectural revival styles that haven’t, thank goodness, been updated. Kingscote was commissioned by a wealthy southerner from Georgia, George Noble Jones (1811–1876), of Savannah, Georgia. His idea of an ornamental “country cottage” in Newport was one of the earliest examples of the trend in which rich people turned Newport into a showcase for revival architecture styles. Like many rich people, he wanted the house to impress his neighbors with the very latest fashion in architecture. He chose Richard Upjohn, who had just moved to New York from Boston. Upjohn was already famous for his work in the Gothic Revival style that had taken America by storm in the early 1830s. In contrast to his two plantations in Florida, Chemonie and El Destino (Leon County), Jones desired a New England country cottage to escape hot summers in Florida. The idea Upjohn came up with for him was a Gothic Revival “cottage” based on then current ideas of what medieval tournament tents looked like. As opposed to Gothic Revival churches and public buildings, domestic architecture in the style was a bit more relaxed in applying strict Gothic elements. The main period of popularity for the style in domestic architecture was 1830–1860, but the style remains popular to this day in church building. Kingscote displays typical features of the domestic version: the steeply pitched roof; hood molds over windows; pointed arch windows; pinnacles with crockets; and the most telltale feature, the curvilinear gingerbread trim along the eaves and gable edges. The Jones family sold the house during the Civil War (1860–1865). The new owners expanded the back of the house with a larger dining room designed by McKim, Mead and White (1876), which contained some of the earliest Tiffany glass in the windows. Richard Upjohn, born in England, was the son of an architect and furniture artist. He became a master mechanic and his family immigrated to the US in 1829. Between 1833 and 1839, living in Boston, he designed many Gothic Revival churches, and the entrances to the Boston Common. 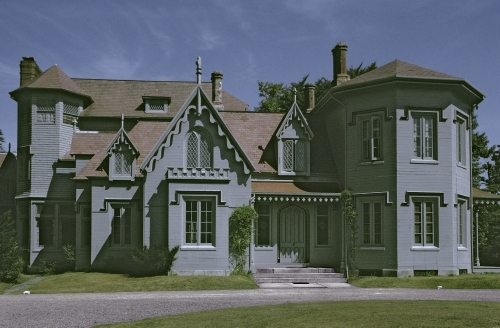 Upjohn is credited for popularizing the Gothic Revival style in America, and he pioneered the Italianate style, a combination of Gothic and Renaissance villa inspirations. His book—Upjohn’s Rural Architecture: Designs, Working Drawings and Specifications for a Wooden Church, and other Rural Structures—in 1852 was massively influential, spreading his Gothic Revival and Italianate styles across the United States. In 1857, he was one of 13 architects who founded the American Institute of Architects. 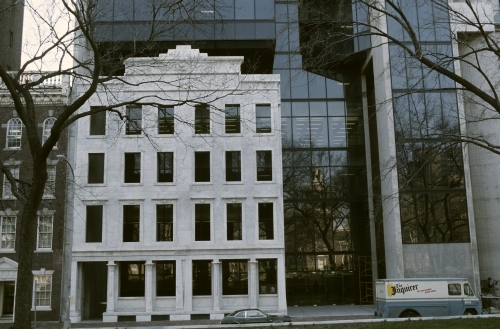 When Penn Mutual (founded 1847) needed a new, larger headquarters in Philadelphia, they did not want to completely wipe out the original building. They hired Mitchell/Giurgola Architects to construct the new tower while preserving the beautiful façade of the earlier building. 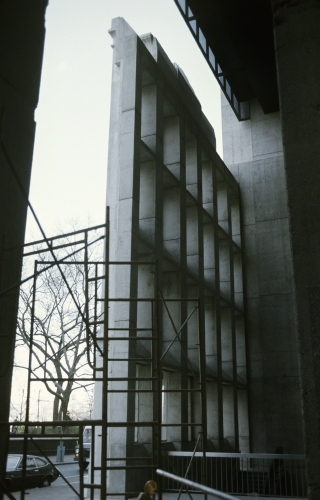 The façade was strengthened with reinforced concrete to preserve it. From what I have seen of many of their projects, the firm is conscious about the historical, cultural, and artistic importance of the interaction of architecture with human beings. What better way to update an old building than by contrasting it with the building that is replacing it? This is the back (reinforced) preserved façade of the earlier Penn Mutual Insurance Company.